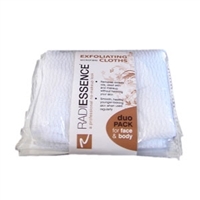 The ultimate exfoliating washcloth for face and body. RADIESSENCE Makeup and Tan Remover is effective for all body cleansing and toning. Packed with natural fruit extracts and Vitamin E (a natural antioxidant), this formulation when combined with the RADIESSENCE Tanning Solution or Tanning Mousse delivers a vibrant natural bronze colour and longer lasting tanning result on all skin types.